Explanation: It was a sky for the imagination. In the early evening last week, the sky illuminating the unaided eye was perhaps even more illuminating to the mind's eye. The unaided eye saw clouds framing the Moon setting over a calm and reflective bay, spruce trees lining the nearby shores, the Pleiades open star cluster (M45) glowing prominently in the center of the sky, the Andromeda galaxy hovering just over the horizon on the right, and the belt stars of Orion lined up on the left, just below the bright orange star Betelgeuse. The bright star Sirius peeked out of the trees on the far left. The mind's eye might further imagine, however, some of the constellations coming to life, with Orion the Hunter taking up his sword and shield, followed into battle by his Big Dog (Canis Major, whose right eye is Sirius), and watched from across the sky by Cassiopeia, the Queen of Ethiopia, sitting on her Throne. 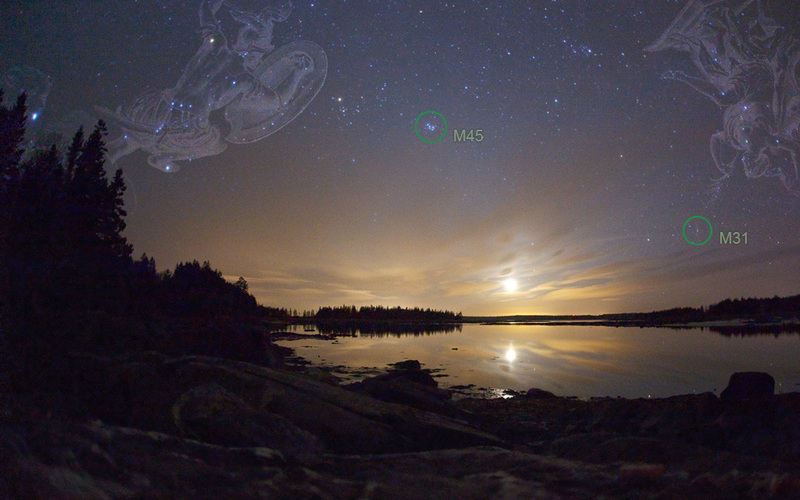 The above image was taken over Pleasant Bay, Maine, USA, and digitally merged with constellations from Uranographicarum, drawn in the 17th century by J. Hevelius.